Originally from Denmark, artist and engraver Anne Vibeke Mou has been studying and working in the United Kingdom for almost 20 years. 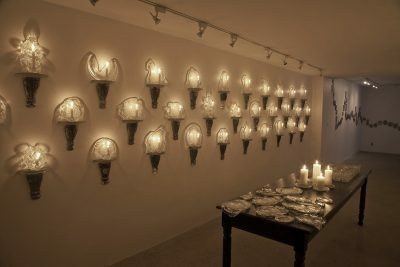 Her interests lie predominantly in the connections between glass and environment, object and place, and the medieval history of both regions has helped to shape her work in rich and revealing ways. Mou practices a meticulous stippling process (engraving a surface with numerous small dots) using a handheld solitaire diamond tool. She is excited to access the Rakow Research Library’s resources to further her research into waldglas (forest glass) and historical sites of relevance. During her residency in March and April 2018, Mou will produce a series of delicate objects “containing traces of organic material from carefully chosen locations,” she says. Fred Kahl, or ‘The Great Fredini’ as he is known, is a New York City-based artist (and magician) who has spent several years pioneering techniques in 3-D scanning and CNC (Computer Numerical Control) carving. 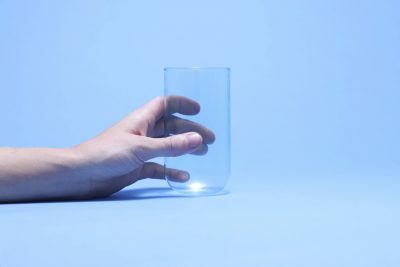 Working at the intersection of art, entertainment, and science, Kahl explores ways to combine new technologies with more traditional glassmaking processes, to invoke awe and wonder in the audiences he engages. Pavlína Čambalová studied gem cutting and engraving at the School of Applied Arts in Turnov, Czech Republic, then Glass Design and Engraving at the Higher Glass School in Nový Bor, Czech Republic. She worked as an engraver at Lobmeyr of Vienna since 2008. In 2014, Čambalová took over the Dominik Biman School, formerly organized by Jiří Harcuba, and renamed it in his memory to the School of Jiří Harcuba. She turned freelance in 2016, and now works in her own studio in Zelezny Brod, Czech Republic. Trenton Quiocho is an artist from Washington State who has worked as a glassblower and teaching assistant at the Chihuly Boathouse in Seattle, the Museum of Glass in Tacoma, and Pilchuck Glass School in Stanwood. Highly influenced by the Venetian tradition, his work focuses on vessels and sculpture, utilizing a variety of colors and applications. With more than 10 years of experience, Quiocho likes to refine his technique and search for his own “authentic voice,” he says. Erika Tada graduated with an MFA from Rochester Institute of Technology in 2005, and a Ph.D. from Tokyo University of the Arts in 2012. Her focus is on the techniques of pâte de verre and casting. 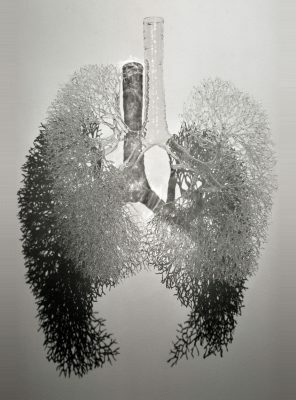 In 2001, Vetro Magazine named Tada “Best Debut Artist at SOFA Chicago.” She has held residencies at The Corning Museum of Glass, Pilchuck Glass School, Museum of Glass, LASIKOMPPANIA, and a fellowship from Urban Glass. She has been an instructor at numerous schools including RIT, Pilchuck Glass School, and Pittsburgh Glass Center. In April 2016, she joined the teaching faculty at Tokyo University of the Arts, Japan. With the full resources of The Studio, the group aspires to combine each of their unique strengths in traditional Czech engraving, glassblowing, pâte de verre, and kiln casting. Their work will seek to embody the emotions inherent in the experience of making glass. Drawing from varied cultures, styles, ideas, and knowledge, Čambalová, Quiocho, and Tada will express the human faces, sceneries, natures, patterns and memories that each bring to the table. “The project gives us the opportunity to experience new techniques, to share our sensibilities and viewpoints, and to influence each other for the future,” they said. Aaron Pexa is an artist who earned his MFA in glass from Rhode Island School of Design in 2014. His work spans multiple mediums, from video and installation to sculpture and performance, and his goal is always to create a sense of bewilderment. He takes everyday environments and subverts them by introducing new artifacts and narratives that stimulate wonder and “bring people out of the pull of predictability,” he says. For his residency in September and October 2018, Pexa plans to incorporate the old English idea of “werifesteria,” which means to wander longingly through the forest in search of mystery. At the center of his project will be a stop-motion animation featuring glass dioramas and other glass elements created using kiln casting, sand casting, hot sculpting, and pâte de verre. Charlotte Potter is an artist whose projects grow in the cracks of time between work and life. Formerly the glass studio manager and programming director at the Chrysler Museum of Art in Norfolk, Virginia, Potter is also an educator, self-employed designer, and recently relocated to Vermont to be a full-time, independent artist. Responding to turbulent societal and political shifts in her environment, Potter feels a responsibility “to create work that is reflective of our modern times.” For her residency in November 2018, Potter intends to continue her project, “Lenticular America,” a series of glass portraits cut into strips and displayed using lenticular technology. Penelope Rakov has been a ceramics teacher, pottery instructor, and for the last ten years has taught glassblowing at schools across the country. With a BFA in ceramics and glass from Alfred University and her MFA in glass from Temple University, Rakov has a broad education in the complexities of glass across many disciplines. With access to The Studio’s hot shops, cold-working and flame studios, and kiln time, Rakov will fully explore every aspect of the glassmaking process. 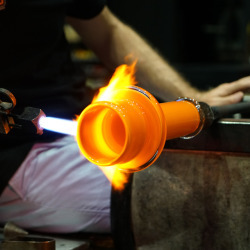 During her residency in November 2018, Rakov will focus her attention on the process of constructing murrine, and hopes to “reconsider what it means to bring an object to completion.” With her own technique for bundling colored cane, Rakov studies the heating and cooling process, taking meticulous record of the changes in pressure and the points that certain colors fuse together. The David Whitehouse Artist Residency for Research is open to artists who want to utilize the Museum’s resources, including the permanent collections and the holdings of the Rakow Research Library, to inform their practice. The residency is named for the former executive director of The Corning Museum of Glass, a highly-regarded scholar who worked to build the resources of the Rakow Library, and was a major supporter of artists working in glass today. This residency gives artists the opportunity to deep dive into topics and further their knowledge or to provide research for a project. During the residency, each artist will give a presentation about his or her work. 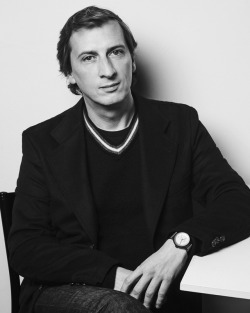 This event, to be held in The Studio Lecture Room, will be free and open to the public. During her research residency in March 2018, Cattrell will have access to the treasure trove of information held by the Rakow Research Library, along with the permanent collection of the Museum. As a self-described “metaphorical excavator,” Cattrell is excited to view lenses, gravity molds, and other scientific models, texts, and drawings held by the Museum to further her research. Claire Bell is an artist from England who began her glass education in Auckland, New Zealand in 2010. Bell has assisted glass artist Garry Nash and served as vice president of the New Zealand Society of Artists in Glass. It was in New Zealand that Bell first encountered the glass engraving style pioneered by John Hutton that has since shaped her own artistry. In the 1950s, Hutton invented his own method and tools to revolutionize glass engraving in architectural settings. Working with clear float glass and applying Hutton’s practices, Bell transforms her own drawings and photography into large-scale glass engravings. Bell is now the only known person “actively pursuing learning John Hutton’s techniques,” she says. 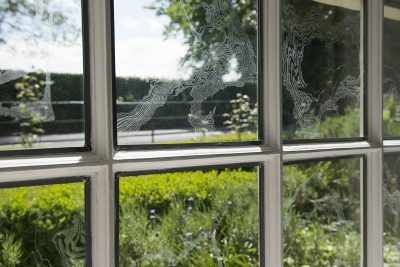 During her David Whitehouse Research Residency in June 2018, Bell will investigate figurative imagery from both historic and contemporary settings and reimagine it using mirrored float glass engravings. The Museum’s glass collection, along with prints and cartoons from the Rakow Research Library, will grant Bell access to material far more substantial than she’s used to. “Currently, I focus on elevating images of everyday, mundane items, such as rubber gloves, or banana skins,” she says. From his studio in the hills of western Massachusetts, Josh Simpson has been fascinated with glass for more than 45 years. 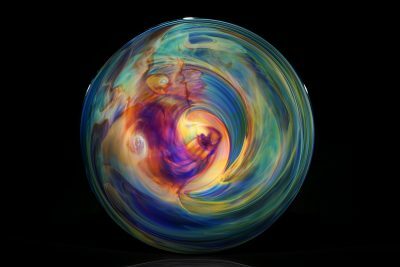 An artist whose work has been shown in group and solo exhibitions around the world, his name is synonymous with the beautifully crafted planets he produces. Simpson’s work and color palette are inspired by the sky and its many permutations throughout the day, including his fortuitous chance encounters with the aurora borealis as he adjusts his furnace at odd hours of the night. For his research residency, Simpson will study the use and history of silver in glassmaking. Simpson has incorporated silver in some form in nearly all his glass work, citing silver as the source of the “Art Nouveau iridescence” of his early work, and the “flaming undulation of colors” noticeable in his more recent ‘Corona’ glass, which seeks to evoke the magic of distant stars and galaxies. Anna Riley is a visual artist whose work emerges from a strong desire for material research. 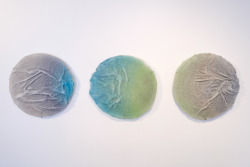 By recreating or altering the circumstances of material manufacture, whether reversing the coloration in glass, or making lime using antiquated burning methods, she considers common preconceptions surrounding materials, only to attempt to do away with them and discover the materials anew. Riley seeks to highlight how materials and their role in our everyday culture are an active component of social life. Riley’s work is “driven by material intimacy,” she says. For her research residency in July, Riley plans to continue her exploration into the history and use of colorless glass. Thinking about the notion of clarity, specifically how it begins to represent purity, and openness, Riley examines glass through the ages, from the “Roman era discovery of decolorization, to the contemporary manufacture of window glass,” she says.